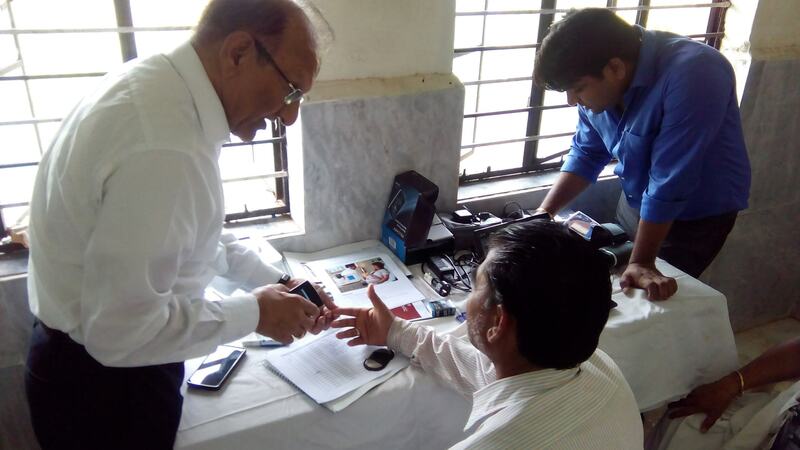 The demo trial was performed in collaboration with primary health center and a district hospital in Maharashtra with an aim to showcase how quality healthcare can reach the deprived corners of the Indian villages using digital health technology. Study patients were chosen by the health center medical staff and by the physician based on selection criteria established with the attending doctors at District Hospital. Patients from both genders, irrespective of caste, creed, race and culture, from the Gadchiroli district were considered for the trial. The study patients were instructed on the assessment and the non-invasive Digital Health devices to be for the measuring the vital signs of the patients and the HEALTH CENTER nurse and the physician were trained on the Digital Health software as well as on the devices. Attending Nurse at the Health Center used Digital Health mobile app and bluetooth connected Digital Health devices to register the patients and record their vital signs. The patient data and vital signs were accessed by the attending doctor in district hospital through Mutelcor Doctor Web portal. The doctor examined the patients’ vital sign measurements and advised the treatment to the patients through the web portal using chat/messaging feature in real time. The patients and the health center staff were then surveyed on their interactions with’ the Digital Health solution after the trial. The definitive trial studies were conducted in accordance with the agreed design without any significant difficulties. Mutelcor Digital Health solution was appreciated by the patients as it gave them access to the required medical assistance at the primary health center even if the doctor is not physically present. Most patients were satisfied with remote consultation, online prescription and advice. Doctors felt that Digital Health provides a means to secure patient monitoring and that the primary beneficiaries of the solution will be the rural population. Hospital staff agreed that multiple patient registrations can be extremely advantageous as more patients can be screened because of quick registration process and vital signs pre-screening ensures that doctor has sufficient information about patients’ medical condition. Digital Health technology platform addresses the most fundamental issue of doctor non availability in the rural health care centers as it not only connects the visiting patient to the doctor remotely but also uses state of the art Digital Health devices for correct diagnosis and pre-screening of the patient’s health. With adequate training on Digital Health solution to health workers, district hospitals, as well as mobile clinics, ‘Health for all’ dream can be a living reality in near future.